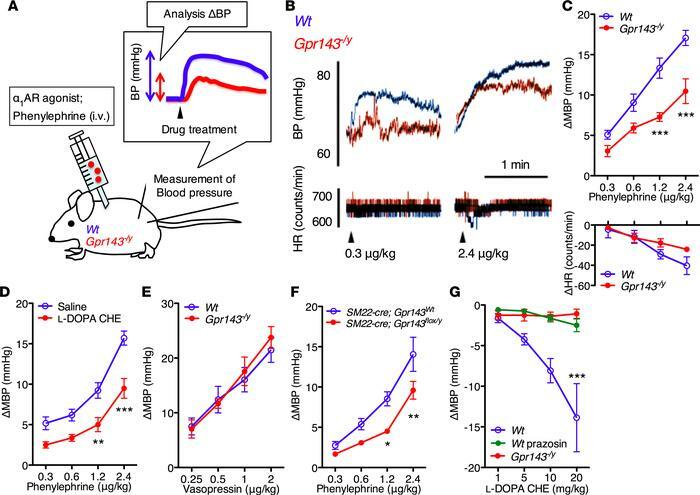 Impaired pressor response to phenylephrine in Gpr143–/y mice. (A) Schematic representation of the experimental design. Measurement of blood pressure (BP) and heart rate (HR) was performed on anesthetized mice, and drugs were administered i.v. (B) Typical traces of the effects of phenylephrine on BP and HR in anesthetized WT (blue) and Gpr143–/y (red) mice. (C) Summarized effects of phenylephrine on BP and HR in WT and Gpr143–/y mice (F1,52 = 42.39, P < 0.001, n = 7 and 8). (D) Effects of phenylephrine on BP under pretreatment with saline or L-DOPA cyclohexyl ester (CHE) (10 mg/kg) (F1,40 = 46.75, P < 0.001, n = 6). (E) Effects of vasopressin on BP in WT and Gpr143–/y mice (F1,32 = 0.209, P > 0.05, n = 5). (F) Effects of phenylephrine on BP in SM22-cre; Gpr143WT and SM22-cre; Gpr143fl/y mice (F1,44 = 20.99, P < 0.005, n = 6 and 7). (G) Effects of L-DOPA CHE alone on BP in WT mice with or without prazosin (1 mg/kg, i.p.) and in Gpr143–/y mice (F1,28 = 10.18, P < 0.005, n = 4–7). All values are mean ± SEM. *P < 0.05, **P < 0.01, ***P < 0.001, 2-way ANOVA with Bonferroni’s multiple comparisons test.